An STM Catholic education is a joyful process of discovery, growth, and enlightenment. Students are encouraged to ask questions and search for answers; to share their ideas, opinions, and perspective; to think critically, creatively, and independently in the light of reason and truth; and to discern with their hearts, as well as their minds. We expect students to be active, fully engaged participants in their own education. We expect students to be fully supportive, positive contributors to the shared learning experience within every classroom. We expect students to be understanding and respectful of the achievements, experiences, and perspectives of their teachers and peers. We expect students to be bold in reaching for academic challenge, knowing they can rely on the guidance of their teachers and the support of their peers. 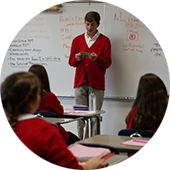 STM Catholic encourages its students to pursue their special academic talents and interests in the hope that knowledge, diligently sought, will serve not only the individual well but also God and others. Each student’s intellectual development should prepare him or her not only for high school and college but also for life in a challenging world. The School seeks to develop in each student a breadth, as well as a depth of knowledge, to encourage in each student an appreciation for creative expression and aesthetic beauty, and to increase in each student an understanding of community and diversity within the human experience.